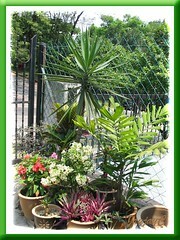 Our garden plants are thriving well in spite of our erratic weather this month. Extremely hot one moment and the next, stormy rains with angry lightning flashes that scare the living daylights out of our pet dog, Maxi, a cross-bred miniature pinscher! A section of our frontyard. An angled view from the left corner of the outer garden border (foreground of picture) to the right corner of the inner border (at the background). 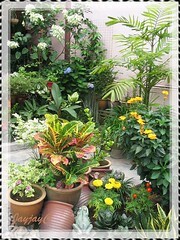 Displaying a palm tree, some flowering annuals and perennials, such as Crossandra , Bigleaf/Mophead Hydrangea and White Mussaenda. This potted crowd of plants is located just inside the entrance to our short driveway, directly opposite the outer garden border; comprising sun-loving plants, such as Yucca, Macarthur Palm, Loropetalum ‘Sizzling Pink’, Bougainvilleas ‘Snow White’ and ‘Mrs. Eva’, 2 varieties of Euphorbia milii, Variegated Oyster/Boat Plant and Desert Roses. Newly added to our garden on August 2 is this beautiful variety, Hippeastrum ‘Mrs Garfield’ that presented us with its first flowering. 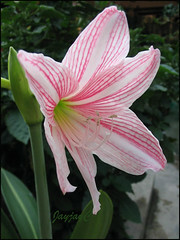 It produced a scape of 5 flowers with striking white central stripe and irregular pink veins on the petals. 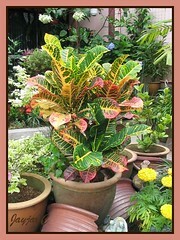 Leaves are short and have a distinct white midrib too. 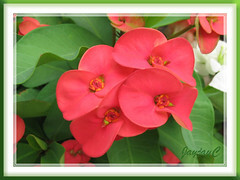 Euphorbia milii (Crown of Thorns), with large deep orange-red flowers. This beautiful variety was gifted to us as a seedling in early February 2008 and a first-time bloomer starting late July and screaming its head off the whole of this month. Awesome indeed! 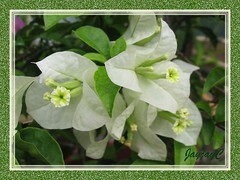 Bougainvillea ‘Millionaire’ or B. glabra ‘Snow White’, a lovely dwarf variety that is a prolific bloomer, practically covering the whole plant with flowers frequently all year round.